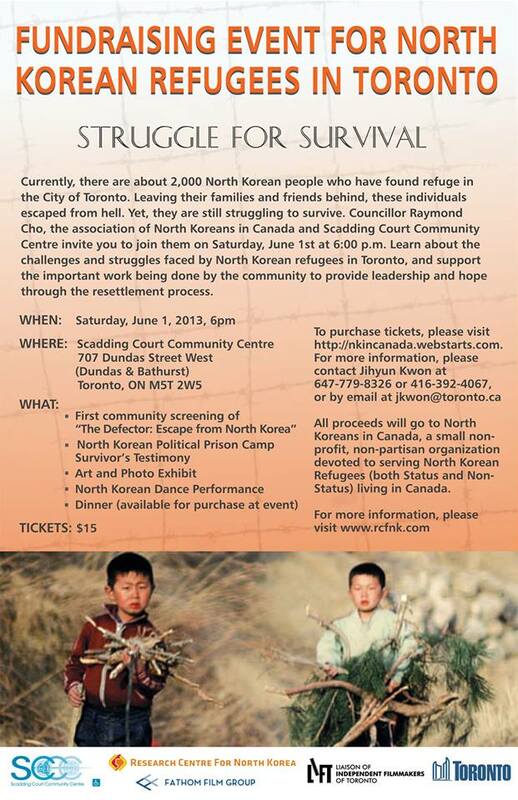 “Struggle for Survival” is an event supported by the Scadding Court Community Centre in Toronto, Canada, and the office of Toronto City Councillor Raymond Cho. Jihyun Kwon, one of the organizers, asked CanKor to help promote the event, whose purpose is to raise funds to assist North Korean refugees in Toronto. See details in the poster below. The event is sponsored by “North Koreans in Canada,” a small non-profit, non-partisan organization devoted to serving North Korean refugees (both status and non-status) living in Canada. According to this organization, there are currently about 2,000 North Koreans who have found refuge in Toronto, but still struggling to survive. Making resources available in the context of North Koreans in Canada for language-related programs and services, health-related services, recreational programs, legal services and economic opportunities programs.